If you and your friends enjoy drinking hot or cold sake at the restaurant and want to have the same experience in the comfort of your home; you must check out our vast selection of Japanese sake sets that we offer at Mrs. Lin's Kitchen. Each sake set features bottles and matching cups.� Choose from distinctive designs available in single sets, for two, and even larger parties. Our wide selection of Japanese sake set designs include: Floral Blossom, Chinese & Japanese Calligraphy, Asian Landscape, Solid Color, Glass Sake Set, and Earthen Sake Set to name but a few. A sake set makes a perfect hostess, house warming, birthday and wedding gift and is a unique way to express your appreciation and thoughtfulness. Since the third century in Japan, people have been consuming sake or �saki rice wine� as it is known in English. Sake can be enjoyed pleasurably by drinking it hot, cold or at room temperature. Normally, lower grades of sake are used when serving it hot. Small sips are poured into �tokkuri,� small traditional sake glasses. Higher grade sake is used when serving it cold, and small sake containers shaped like boxes, "sake masu" are the serving vessels. 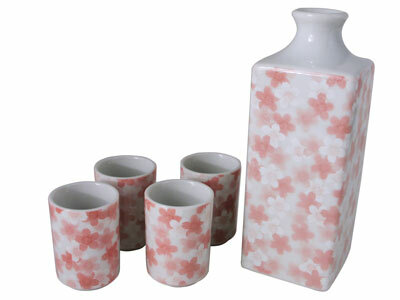 Mrs. Lin's kitchen carries sake sets for every occasion that will suit everyone's taste. From Japanese sake set collections, sold color sake sets, celadon sake bottles to cold sake carafes, you will be sure to find a perfect set with which to enjoy a quiet evening, or to toss back a sake bomb.